At Bat 2014 is a freemium app for baseball fans that is one of the best ever released for a professional sports league. While the free version of the app provides a scoreboard, league leaders and news, the premium version adds many more features. For $20 (or $2.99 a month), At Bat users can hear the home or away radio broadcast for every game and view video highlights of games still in progress. You even get access to plays subject to video review. And with the premium version of the app, you can view the MLB.TV Game of the Day. If you're about to upgrade to the premium version of At Bat 2014, and you're a T-Mobile customer, put that credit card back in your wallet. According to the carrier's support site, when you attempt to stream a live broadcast, you will receive an invitation from T-Mobile. Press the redeem button, and the nation's fourth largest carrier will pick up the tab for your premium version of At Bat for the rest of the season. The offer started on May 1st and ends on September 30th and apparently covers the iOS and Android version of the app only. You might remember that T-Mobile offered its customers a similar freebie last year. The mobile operator has a special relationship with MLB, including a sponsorship of pitching changes. In some parks, T-Mobile has set up special 4G phones that connect from the dugout to the bullpen. Why no WP love tmo?! I'm assuming this is for postpaid customers? I can't see them allowing me and my $30 prepaid plan access to this sweet deal. I just signed up for deal - pretty awesome that I can listen in on the games - reminds me of how it was as a kid before we had a ton of options to watch the games. Baseball is and always will be a sport that is better on the radio than on a TV. 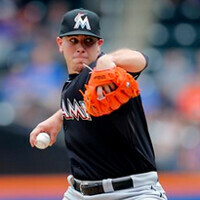 That's my boy Jose Fernandez on the pic. Go Fish! !